Trec Booster Whey Protein is a high-quality protein supplement containing whey protein concentrate with the addition of MCT oil. The supplement has a low carbohydrate content and is sweetened only with sucralose. The product’s composition has no unnecessary additives reducing the content and absorption of protein. The supplement comes in many delicious flavors, easily appealing to a wide range of tastes. 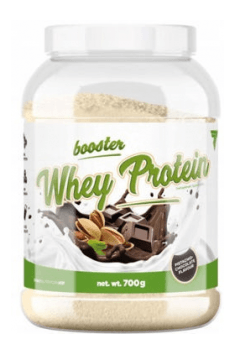 What distinguishes Booster Whey Protein from other protein supplements is undoubtedly its high protein content (up to 21 g in 1 portion) and the addition of MCT oil, that is medium-chain fatty acids that are quickly available energy for the body. Protein demand increases with the level of physical activity, especially in resistance training. The proteins, or more precisely amino acids that build them, are used to restore damaged muscle fibers and other tissues such as tendons and ligaments during a workout. High protein content in the diet has a positive effect on the regeneration process, building muscle mass and silhouette composition. The whey protein concentrate is obtained from milk and has a high biological value index BV (Biological Value), defining the amount of protein assimilated at once by the body. The whey protein concentrate has BV = 104, and this is because it is a good source of exogenous amino acids that the body itself can not synthesise and therefore they must be supplied with a diet. In addition, the whey protein concentrate is absorbed from the gastrointestinal tract after just 30 minutes, and its full assimilation and blood saturation with amino acids occur after about 1.5-2 hours. Due to its rich aminogram, Booster Whey Protein perfectly supports the body's anabolic processes. In addition to exogenous amino acids, it also has a high content of branched-chain amino acids (BCAA), which include L-Leucine, L-Valine, and L-Isoleucine. MCT oil is an oil that supplies medium-chain fatty acids (Medium Chain Triglycerides). In comparison with long-chain fatty acids, MCTs are not digested and broken down into shorter acids, but they move into the small intestine and there they enter the bloodstream providing almost immediate energy. Medium-chain fatty acids can be used as a fuel source for muscles, improving training capabilities. In addition, studies have shown that consumption of MCT compared to long-chain fatty acids results in greater loss of adipose tissue, which in combination with an appropriate intake of protein may have a positive effect on the composition of the body. In conclusion, Trec Booster Whey Protein is a protein supplement enriched with MCT oil. It has a high content of well-absorbed protein and it effectively replenishes the daily body's reference value for amino acids. Medium-chain fatty acids are a source of quickly available energy for the muscles and they positively affect the composition of the body. 30 g (2 scoops) dissolve in 200 ml of water or milk, mix in a shaker or a blender. Take 3 servings daily, I serving in the morning after getting up, II serving up to 1.5 hours after training and III serving at bedtime. Take 3 servings daily - I serving in the morning after getting up, II serving between meals and III serving at bedtime. Due to a very small amount of carbohydrates per serving (1.4g) and the addition of MCT oil, the supplement is recommended for people who are on high-fat diets. The supplement can also be used as an addition to desserts and baked goods. The use of protein supplement should supplement the protein needs and shouldn not be its only source. Depending on the type of sport performed and the target chosen, the protein requirement is 1.6 to 2 grams of protein per kilogram of the body. Cocoa (4.5%) for flavors: chocolate-wafer, marzipan-chocolate, pistachio-chocolate, triple chocolate, chocolates; aromas; maltodextrin for flavors: cappuccino, caramel-toffee, coconut, peanuts and banana, apple pie, salty caramel, cream; thickener – sodium carboxymethylcellulose; freeze-dried banana (0.5%) for peanuts and banana flavor; freeze-dried apple (0.5%) for apple pie flavor; natural cream flavor (0.5%) for cream flavor; coconut water powder (0.5%) for coconut flavor; acidity regulator – citric acid for apple pie flavor; sweetener - sucralose.